Price-comparison website BuyHatke has received $1 million (Rs 6.4 crore) investment in seed funding from Infosys co-founder S Gopalakrishnan and Japanese e-commerce company Beenos. BuyHatke, run by Bidon Services Pvt Ltd, gives price comparisons between different websites offering the same products. The Bengaluru-based startup said the funds will be used to market the platform, develop products and expand the team. BuyHatke was founded by Gaurav Dahake, Prashant Singh, Srikanth Sethumadhavan and Rohit Shah, all IIT-Kharagpur graduates, in 2012. The platform fetches pricing results from various shopping portals and shows the best deals available to customers, who are then redirected to the shopping portal to complete the purchase. "BuyHatke wants to extend its lead and get a step close to its vision of delivering the ultimate shopping experience by becoming the de facto starting point of shopping research," said Gaurav Dahake, co-founder and CEO. The company claims it serves over 10 million product searches via its platforms, featuring over 30 million products from over 300 websites in India. 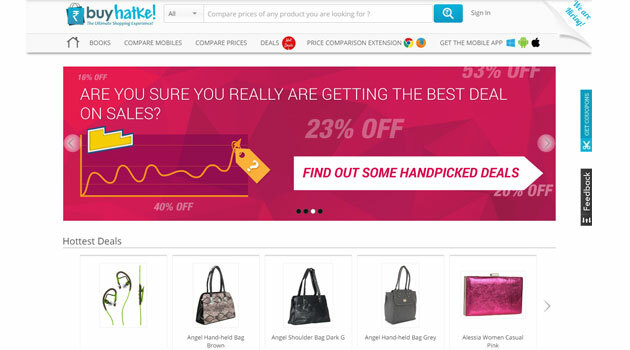 It features leading e-commerce portals like Flipkart, ebay, Infibeam, Homeshop18, Jabong and Myntra on its platform. Gopalakrishnan, who invested in startup in his personal capacity, said the firm with this seed round plans to scale to about 10 million monthly unique users by the end of this year. Co-investor Beenos said, "We see an interesting dynamic unfolding in the Indian e-commerce industry and comparison shopping aggregators can help consumers find the best bang for the buck. We loved the innovations that the BuyHatke team had worked on." BuyHatke first came to the limelight when the Chinese mobile phone manufacture Xiaomi launched its devices in India last year where users could quickly purchase the handsets with the Chrome web browser extension that BuyHatke developed.